Last week I had some leftover pumpkin from making a pumpkin roll and just happened to have sweet potatoes left over from Christmas dinner at the same time, so I pulled some frozen “squash” out of the freezer (why I labeled it with only “squash” and not the variety, I do not know) and let it thaw for a big ol’ batch of dehydrated baby food. I used the same general method as when I did the carrots–cook the food, puree it, spread it on the dehydrator like fruit leather and dry until crispy, then put the crispy stuff in the blender until it was powdered. The sweet potatoes were already cooked from the dinner–they had been baked in foil like a baked potato and then the peels were taken off after the baking so didn’t have any butter/spices/etc already in them. Just plain ol’ baked sweet potato. I had to add water to them in the blender to make it thin enough to pour. You might think by adding water you’re increasing your dehydrating time, and that may be true, however, you want to be able to spread your pureed food fairly thin and even on the dehydrator trays so it will dry into crispy chips more quickly and not take forever and turn out thick and hard like a rock which just makes more work for your blender when you’re trying to powder it. So go ahead and add some water to get your food to a spreadable consistency if you need to. These dried up really nicely. I’ll be wanting to do some more sweet potatoes in the next few months as I only got a little bit out of our leftovers. Sweet potato powder. This could also be used in baking mixes if you want biscuits or bread or something with some sweet potato in it. I’ll probably just feed the baby with it. The pumpkin was canned pumpkin left over from making a pumpkin roll. There was a little less than a cup of it to start with, so I pureed it with a bit of water and spread it out on the dehydrator trays. Because I was only putting one swath of plastic wrap down the middle of the tray, it took almost two trays to spread it all out. I’ll have to check the label on the canned pumpkin to see if it’s baby safe before I feed it to the baby. This may go into a bread mix instead. If you were to cook and dry your own pie pumpkin, you’d know for sure that it was only pumpkin. It dried fairly well–took a while to get crispy. It seems like the food gets leathery pretty quick, and then takes a long time to crisp up. All powdered up it came out to just under 1/3 cup. So I’d guesstimate approx 1/3 cup pumpkin powder for each cup of pumpkin in your recipe. You’ll need to add a bit of extra liquid in your recipe for it. Or just rehydrate it and use it that way. Some of the squash I added water to and some I didn’t because of the consistency of it when it thawed from the freezer. Some of it dried really nicely and some came out really hard. I think that had to do with the fact that my plastic wrap didn’t stay in place on a couple of the trays, so instead of breaking apart as it dried, it all squished up into one chunk of squash in the center of the tray–kind of like those shrinky-dinks that you draw on and put in the oven and they come out as a smaller, thicker version of the original. That made it take those couple of trays another “overnight” in the dehydrator to get crispy after everything else was already done. Guess I’ll be taping my plastic wrap down in the future. After blending it into powder, I’ve got a nice little bag of nearly instant dehydrated squash baby food. Sweet. I’m pretty excited about it. I’ve still got squash from this year that needs done (that’s the good thing about winter squash, they’ll keep a few months before needing cooked and eaten) so we’ll get some more from that. This method obviously works for starchy veggies. I still need to try some kind of green veggie like beans or something and fruit also. It’s just that they’re not in season right now, so another time we’ll get to those. Super sweet addition to the baby 72 hour kit–just make sure you’ve got enough water or a filter for water or pump for breast milk to re-constitute them. What a fantastic idea—“Powdered Veggies” I love it. :-) I wish I could find Powdered Veggies in the stores. Awesome ideas! Cannot wait to try it! It sure would be easy to make carrot cake with these “squash” powders. Thanks! I will share this with my small storage group, they are always looking for different ways to change a simple recipe. I just found your link. Can you recommend a book or ? with more info about saving seeds? Also, do you have a newsletter you send out? If so, please add my name. Charlotte, A great reference for saving seeds is Seed to Seed by Suzanne Ashworth. It has information and instructions for saving seeds from many varieties of plants–mostly vegetables. I haven’t tried dehydrating fruits into fruit leathers….this is really interesting. Is the plastic wrap placed down on the dehydrator tray and then the puree is spread on top of it? Just wanted to make sure I’m understanding correctly. I tried dehydrating tomatoes this past summer and after using 4 trays, I ended up with less than 1/4 C of tomato powder. I’m wondering if this method (puree) would work for those also. Great site! Glad I’ve found it! Toni, yes, the plastic is placed on the tray, then the pureed fruit is poured on top of it. I like to secure the edges of the plastic wrap so it doesn’t just shrink up during the drying process. I want it to stay flat. Some dehydrators come with fruit leather trays, and some you can buy them separate. I’m not sure how the plastic wrap would work on one of the round tray dehydrators, but it works really well on Excalibur’s square trays. And this method would also work with tomatoes to make tomato powder. You wouldn’t have to do anything with the tomatoes before pureeing them besides wash and core them. 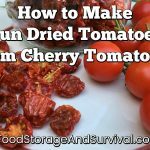 You could probably get a few more tomatoes on the dehydrator with the puree than just putting tomato slices on the trays. I’ll have to try that with some of the fruits or veggies I have now….mainly things that would be good to add to breads, like you mentioned. Currently, I have a round dehydrator – I won’t complain about it though, as I picked it up for about $1 at a garage sale! It had gotten wet inside, so my wonderful husband took it apart, dried it out, cleaned it up, and it’s been great ever since! There are no fruit leather trays with mine, and the trays have widely spaced slats, but I think I could make it work. Thanks for the feedback…. I have a 8 month old who just quit eating his baby food (he thinks he’s too big for it now, lol) and I have so many jars of baby food. Would this work for the jarred baby food? Because if it would that would be great for him and my 3 year old. But it is a very cool idea! I have 7mo baby, started eating solids. She especially doesn’t like the taste of jar foods, so I found it very troublesome to travel with her as I have to cook all of her meals. I am wondering if this excalibur dehydrator can also work on baby purees (consists of meats and veggies)? and one more thing, This excalibur dehydrator has a fan on the back, do you need to rotate the tray so that the foods dried evenly? My dad is the one who invented the Excalibur dehydrator over 30 years ago and the reason he put the heating element with the fan in the back was so it has even drying and you don’t have to rotate the trays. Happy dehydrating! Oh yeah by the way you can use the paraflexx drying sheets for puréed foods instead of the plastic wrap. That way it is reusable and you don’t have to go through rolls of plastic wrap. My favorite is dehydrating yogurt on the paraflexx sheets. Yum! Emily, thanks to your Dad! I have an Excalibur and love it. My aunt has one from 25 years ago and is planning on aquiring another to use both at the same time. Amazing product!